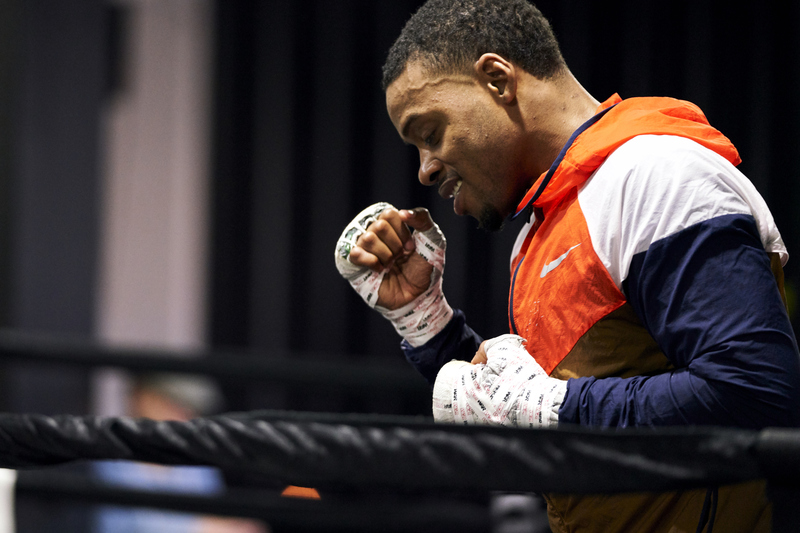 Errol Spence Jr. trains at his gym in Dallas on March 7. 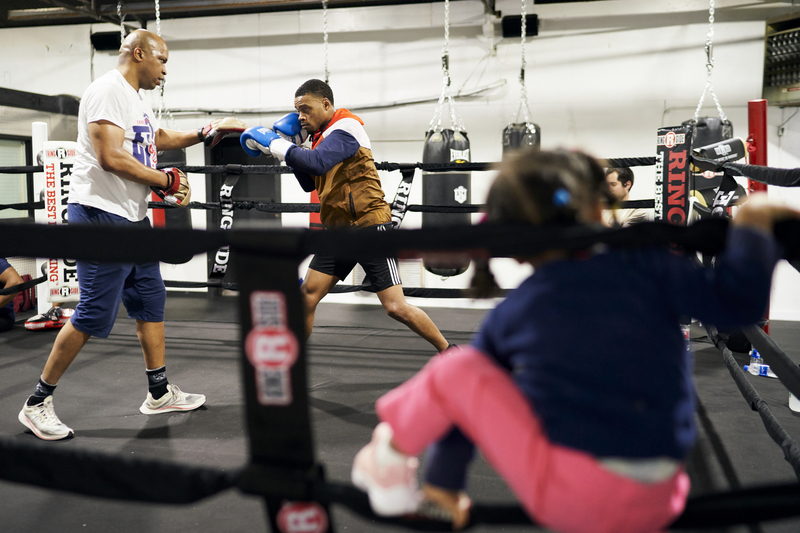 Born in Long Island, New York, and raised outside of Dallas, Errol Spence Jr. spent much of his youth on the football field before his father introduced him to boxing during his sophomore year of high school. Now 29, Spence has spent nearly half of his life in the ring and the notoriously grungy boxing gyms around the world but he saw boxing and its culture change drastically with the birth of his first daughter, Ivy, in 2015, followed by the birth of his second daughter, Violet, in 2017. Since the birth of his first daughter, the undefeated Spence (24-0) has added another six victories, five of which were by KO or TKO, including an 11th-round knockout of Kell Brook in his hometown of Sheffield, England, to take the IBF welterweight title, followed by title defenses against Lamont Peterson and Carlos Ocampo. 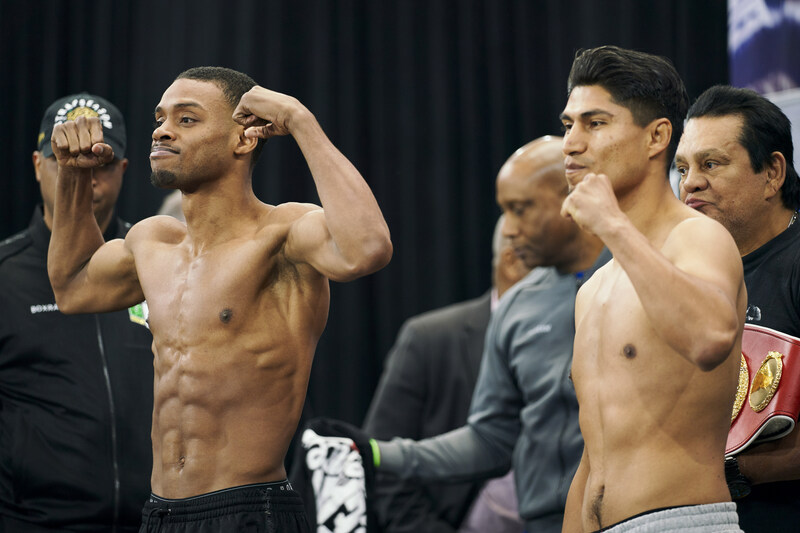 On Saturday, Spence will enter the ring in his hometown of Dallas for his third title defense, against undefeated Mikey Garcia (39-0), at the home of the Dallas Cowboys, AT&T Stadium, where Spence plans to put on a show for his family, his friends and his city. 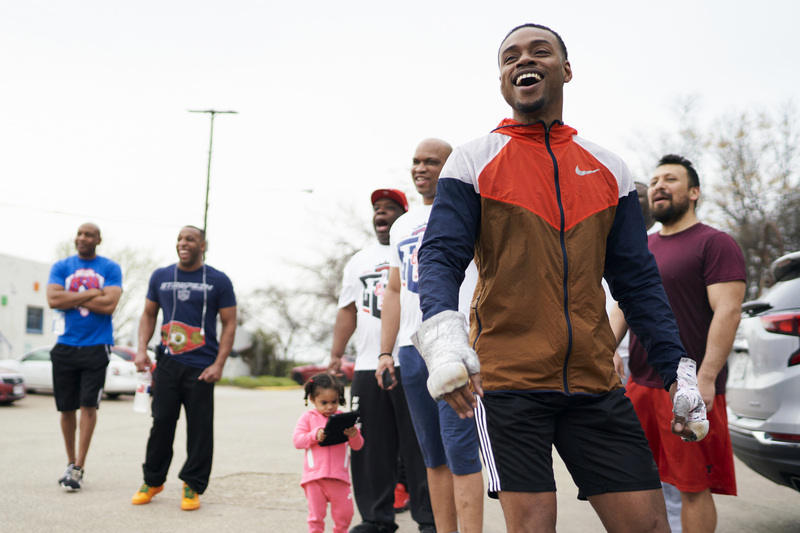 Errol Spence Jr. (right) and his team stand outside watching two of his friends race down the street. Keeping the mood light during training camp and surrounding himself with close friends and family have always been top priorities for Spence. 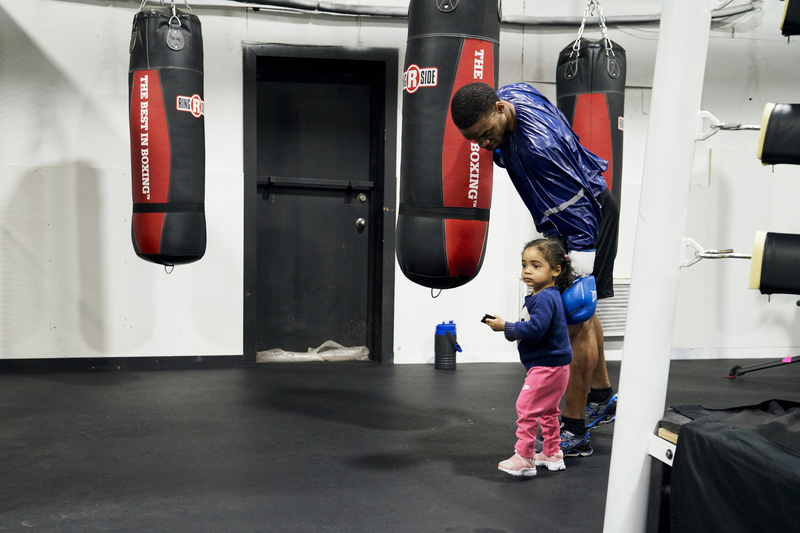 Spence and his second daughter, Violet, walk into the gym where he trains. After moving gyms with longtime trainer Derrick James a few times over the past few years, the two agreed it was time for James to open his own spot in a quiet, nondescript neighborhood in Dallas. 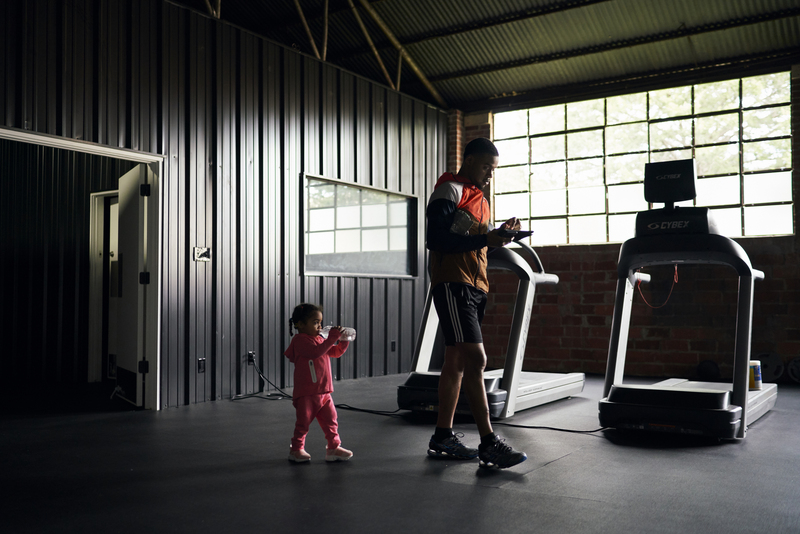 With his own gym, Spence is able to control who enters and what music is played — he knows his two daughters are listening even if they’re watching PAW Patrol. Being able to clean up the gym environment so his girls can spend more time with him was a big deal. 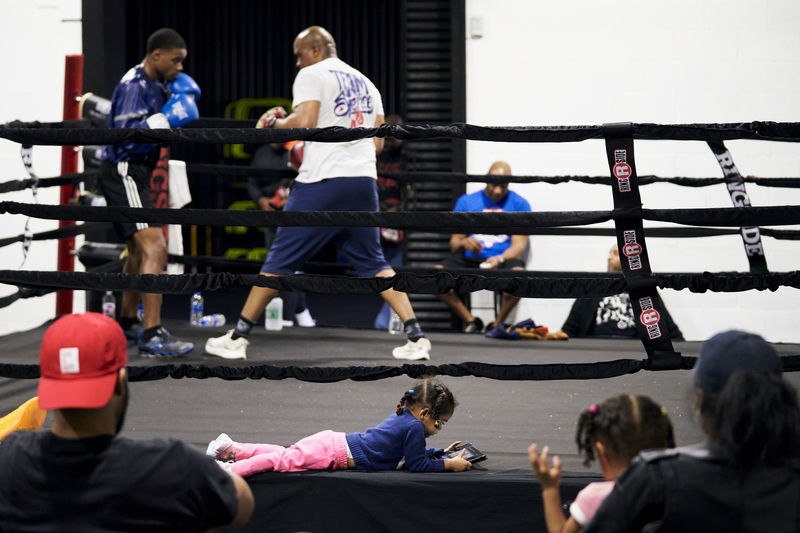 A benefit of having his own gym is that Spence can have his own spot to change his daughters’ diapers. When using other gyms, he would take them out to the car to change them because there were not enough private or clean spots inside. During the tail end of camp, Spence focuses more on speed, agility and cardio than strength training as he slowly cuts weight to hit the 147-pound welterweight limit. 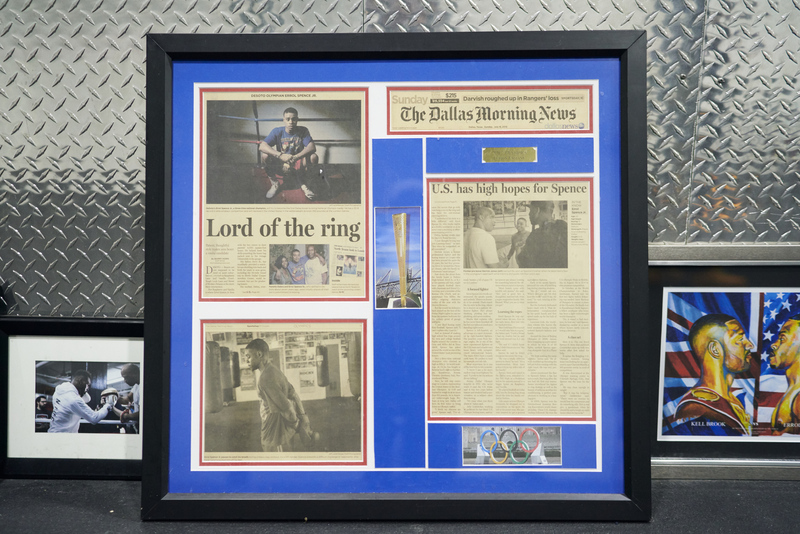 The Dallas Morning News featured Spence leading up to his 2012 Olympic debut. At left and right are other gym memorabilia. 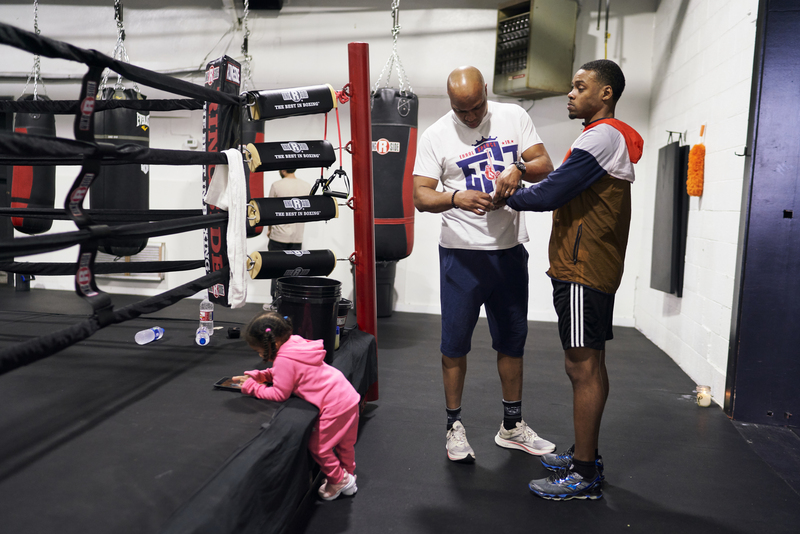 After shadowboxing, footwork drills and mitts, Spence (with daughter Ivy) follows with heavy bag work and some cooldown stretching to round out a standard 2.5-hour workout. 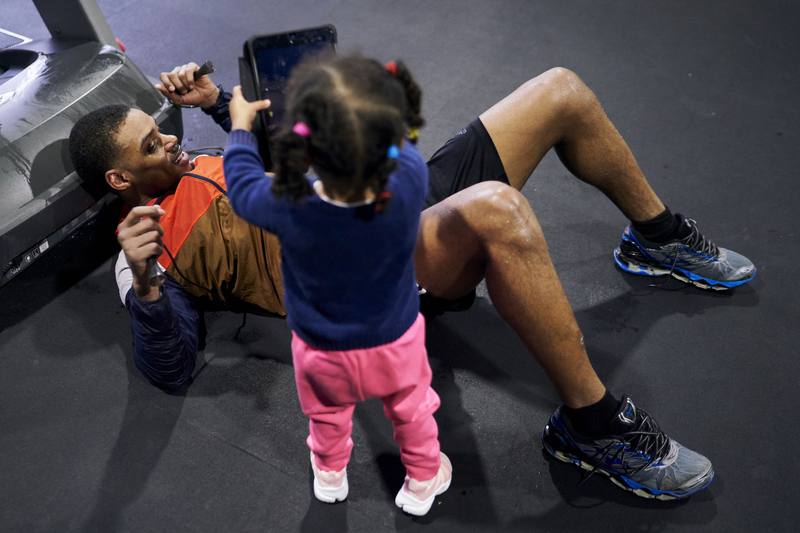 Nothing takes his focus away while he trains — except when one of his daughters comes by to take a photo or ask him to put on a show for them on their tablet. Spence, high-fiving daughter Violet, will cut around 4 pounds of water weight before weigh-in to make the welterweight limit. Once training at the gym wraps, it’s time to relax for a bit and hang out with Ivy and Violet before putting the girls to bed. Late-night runs are commonplace for Spence during his training camps as he tries to get his body accustomed to training at the time his fight will take place. 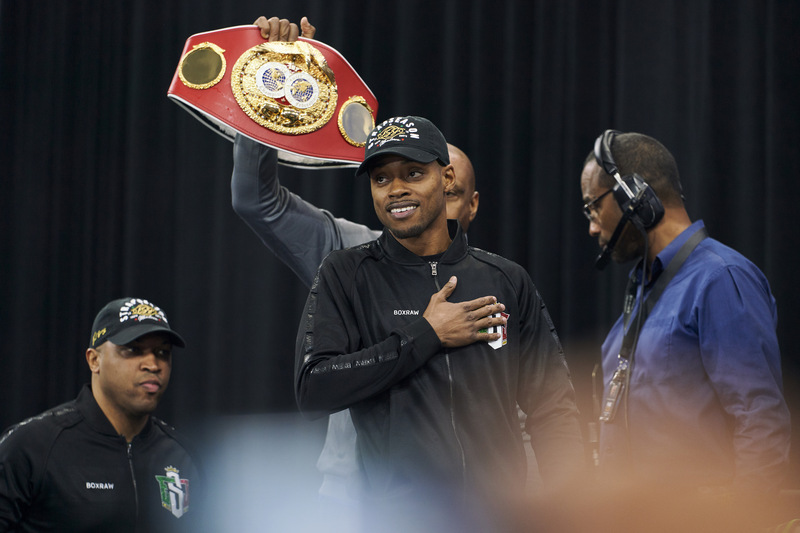 Errol Spence Jr. takes the stage for the official weigh-ins for his IBF welterweight title fight against Mikey Garcia at AT&T Stadium in Arlington, Texas on March 15, 2019. 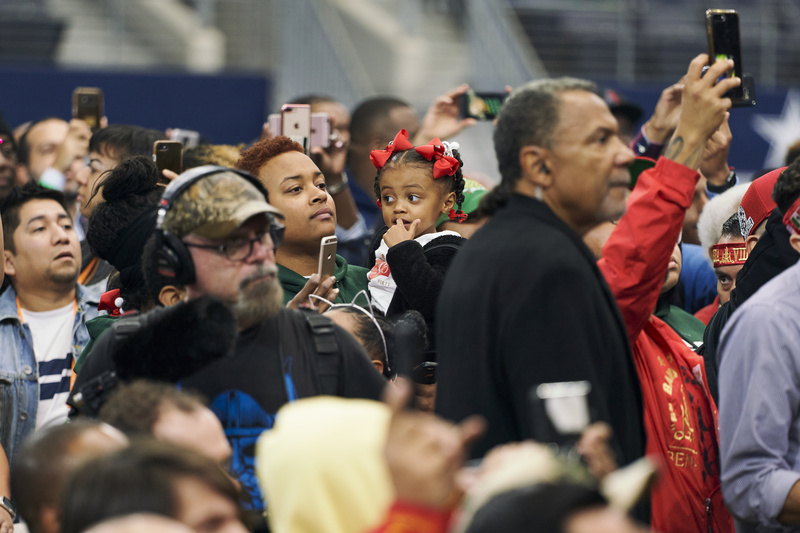 Errol’s daughter, Ivy, watches her father weigh-in before his fight against Mikey Garcia with Errol’s sister, Kaila Spence. Errol Spence Jr. and Mikey Garcia face off during the official weigh-ins for their IBF welterweight title fight. 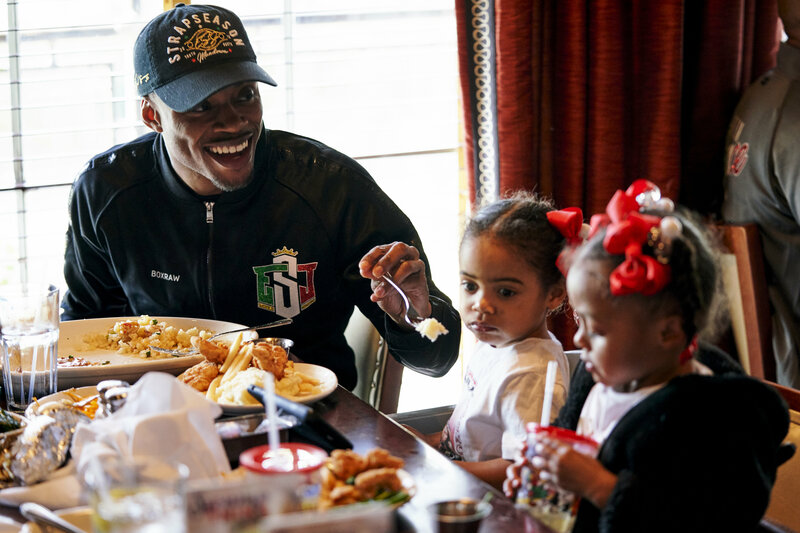 Errol Spence Jr. tries to feed his daughter, Violet, while Violet and her older sister, Ivy, watch Paw Patrol at Pappadeaux Seafood Kitchen in Arlington.